I haven’t posted much about my crafty adventures and that’s because my studio hasn’t seen much activity in a while but this weekend I had a bit of fun with some projects. Well, first I do have to give a lot of credit to my husband who patiently waited for me at two different scrapbooking stores this weekend. We were running errands and I just had to take a peek at two stores. There was one mishap in the studio when I was having so much fun with the spray ink and accidentally caught an unfinished journal. Oh well, it’s all part of the process of having fun and creating. Anyway, I’m thinking of adding tags like these to my shops but not sure yet. What do you think? In the meantime, I have six tags to giveaway so if anyone wants one let me know and I’ll send you one! 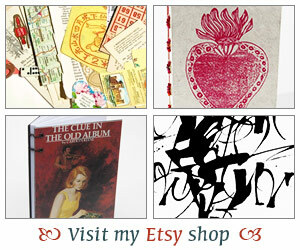 You can use them for journaling or as bookmarks too. Next post I promise to return to regular book chat. I’ve got to tell you about the books I want, books I’ve read and books I’ve received! I’ll throw my name in. I am always up for things that can be used as bookmarks! I love those tags! Please put my name in for one. I love your craftyness. Because I am so not. I love the tags and would probably use them as bookmarks. I’d love to be entered for one. Thanks! The tags are great! It’s always fun creating something. My crochet muse has actually visited me these past few weeks and I’ve been whipping up little coffee cup coasters, also some scarves and hats for the upcoming winter season. 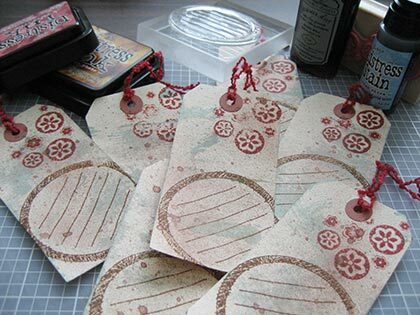 I miss doing crafty things like this–I have all sorts of papers and rubber stamps and ephemera but no time to spend on it all. Can’t even seem to find time to stitch lately. Your tags are beautiful though!